If there’s one time of year to get traditional in the kitchen, let this be it. Growing up, this meant pulling out the shoebox of ancient aluminum cookie cutters and rolling out batches upon batches of Ethel’s Sugar Cookies. There were years when my mother made up to five or six times the instructed batch size. Once my sisters became bored with the cookie production (usually after about 10 minutes), I would continue, maniacally rolling, cutting, and decorating for hours until the red and green toppings had dwindled to sugary dust. 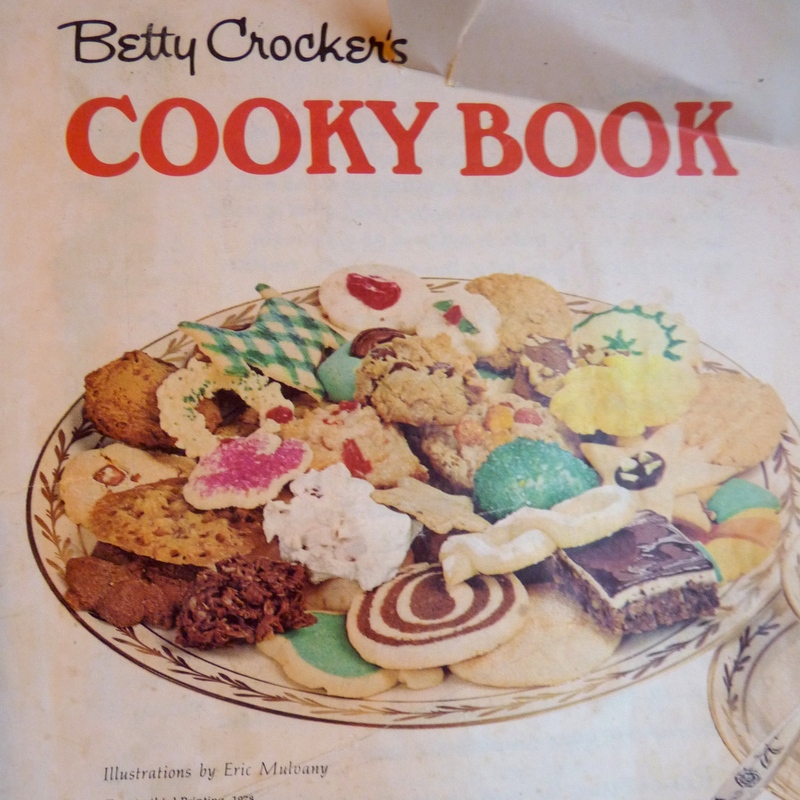 The recipe for Ethel’s sugar cookies is from a Betty Crocker cookbook, called the ‘Cooky Book’. I think the odd spelling of the singular form of ‘Cookies’ is a testament to just how old that book is. Pages and pages are dedicated to Christmas cookies, and there are two recipes for the classic Christmas sugar cookie: our family’s standby, Ethel’s, and another called Mary’s. Once, as a child, I convinced my mother to try out the Mary’s, just for fun. They were fine, but did not come close to the perfectly simple vanilla sugar flavor of Ethel’s, which seemed only to get better into the first weeks of January. The recipe is incredibly easy. You’ll see that it calls for a mixture of ‘shortening’ or margarine, but please ignore this and go for all butter. That book was printed back in the day when people thought margarine was a health food. Another recommendation from years of making Ethel’s is to leave the dough to chill in the refrigerator overnight. It will seem very hard when you take it out to roll, but the chilling time is important to give the flavor a chance to develop and keep the dough from getting too sticky as you work with it. This year we will be staying in Berlin for Christmas. I managed to whip up a double batch of Ethel’s last week to have plenty of sugar cookies on hand for our holiday party over the weekend. 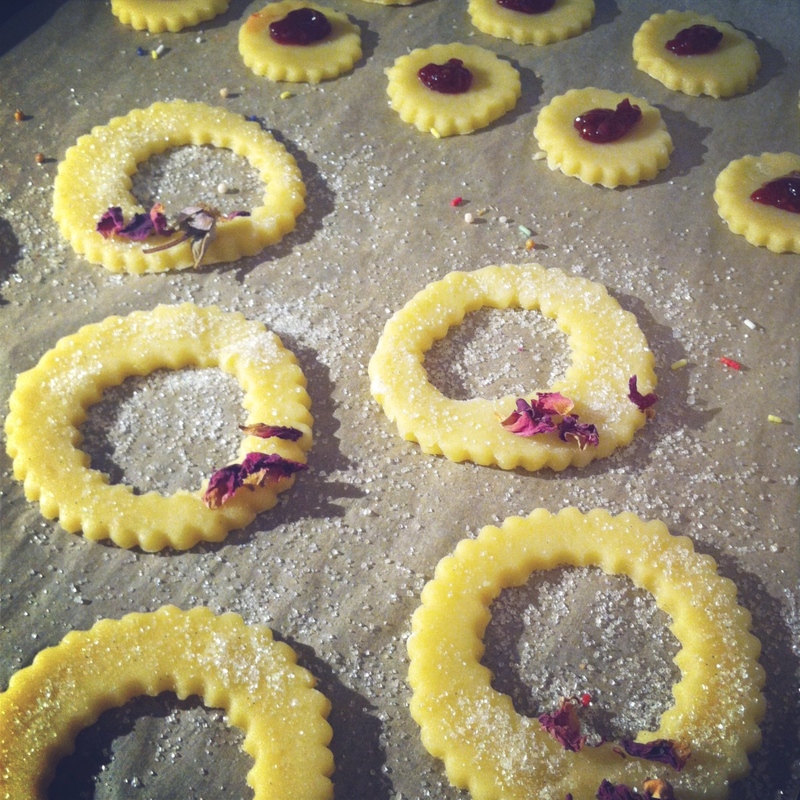 Some I decorated with colored sugar, others more maturely with tiny rose leaves or vanilla sugar with cardamom. Alas, I (inadvertently?) neglected to put them out on the buffet. Oooops. At least it ensures we’ll be eating Ethel’s into January, just as it should be. Autumn means apples. More specifically, apple picking. At least where I come from. Though, unfortunately, not where I currently reside. After what felt like days spent in futile research for locales in the Berlin area suited for selber pflucken, I managed to find a small farm where one is allowed to roam the orchard, chomping and picking away through rows of Boskoop and Elstar. I only truly realized how typically American apple picking as an autumn activity is after noticing that there were more English speakers than German at this small orchard about an hour and a half outside of Berlin. Now, many of you from the Northeast of the United States are familiar with that wholesome tradition of bounding out into the wild countryside on a sunny October weekend, in search of the kind of apples you just don’t find in the supermarket. You want not only to pick the apples yourself, but also to be guided out into the orchard by a friendly, suntanned farmer (ideally in the back of a hay-filled pickup truck or similarly-decorated vehicle) and given a hand-hewn wooden crook with netted basket on the end, to pluck the best trappings at the top of the tree. The apple trees should be large enough to climb, their branches dripping with red or golden-colored fruits. While onsite, you should eat apples from as many different branches as you possibly can without paying for them. If that means taking one bite, and throwing it aside, so be it. That’s the glory of apple picking. Because if you don’t eat it, its fate will be on the ground, in apple mushdom. 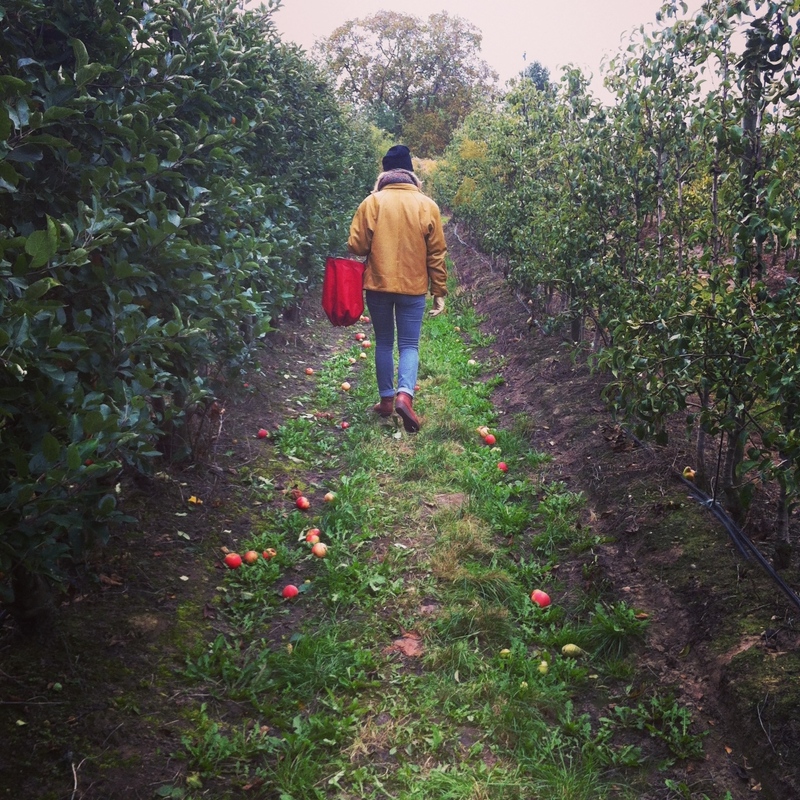 But the process of actually picking the apples is only the start, and, dare I say, a minor part of the experience. I have already mentioned farmer- driven hay rides. But let us not forget a stop by the cider house, to watch the rotten apples being churned to delicious cider (it’s not just for kids!) right before your very eyes. Buy a few bottles to bring home (you’ve rented that expensive car, after all – better fill it), and drink one on site, to wash down the two or three apple cider donuts that you will inevitably purchase and immediately consume. But, please, do me a favor and skip the fudge counter in the gift shop. You really don’t need all that white sugar after eating three apple cider donuts on top of countless apples back in the fields. You will only regret it later when the sugar crash hits during the car ride home. Kitsch? Yes, maybe a little. The lowest on the totem pole of apple picking locales are simply over-priced traps for wide-eyed city folk wanting a day out in the fresh air. The best of them, typically lying far outside the reaches of the New York or Boston metropolises, are colorful, unpretentious hillside orchards marked only with a ‘U-PICK’ sign. A pile of half-broken baskets, a big scale, and maybe a couple of ladies selling fresh donuts and apple cider from the leftover harvest is really all it takes by way of ‘customer experience’. If the focus is on the farm itself, and caring for the apple trees, the decision to allow the public to come and self-pick being an option, the rest should follow naturally. Long story short, I didn’t need the Disneyland of Apple Picking to satisfy my longing for a New England fall day. I won’t say that what we found was disappointing, but a bit lackluster when compared to what I know apple picking to be in my past. Nevertheless, we came home with a stash that’s still hanging around, with varieties I have never tasted before, from tiny plum-sized sour apples to huge and sweet crunchy ones. 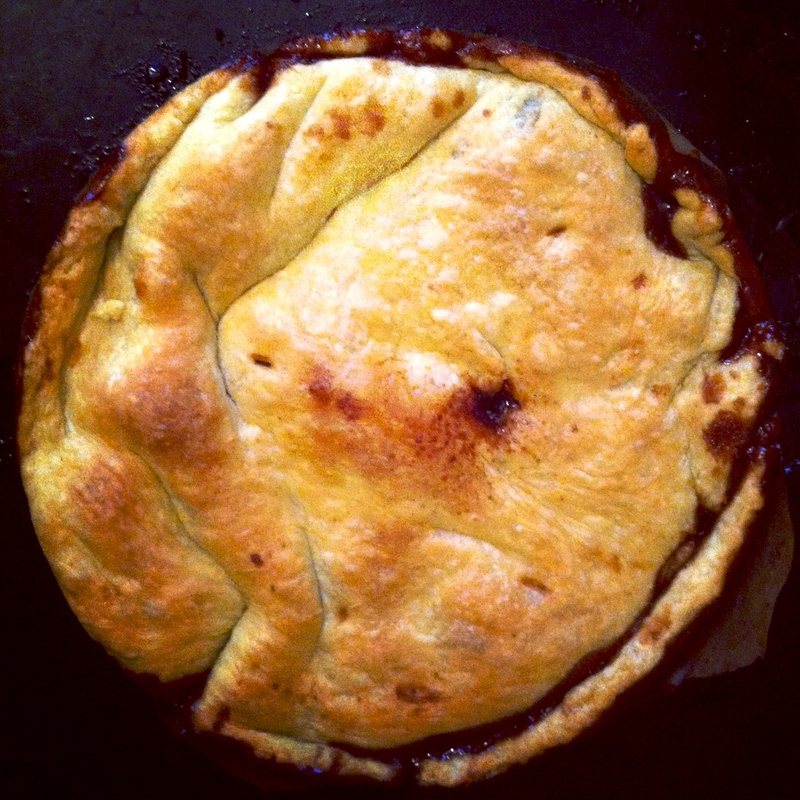 I have already written about my own (and – if I may say so – superior) apple pie. But this pie is currently being challenged by its French stepsister, the Tarte Tatin. My friend Benoit, with a fine reputation for down-home French cooking (see previous canelé post), baked a classic Tarte Tatin to contend with my American-style apple pie. I’m not kidding; there was actually a well-attended competition. Complete with secret ballots. While the vote was close, I won’t say who the victor was, but only that I have secured his simple, mouth-watering recipe to share with you all here. 2. Begin by preparing the tarte dough. Combine all dry ingredients in a large bowl and cut in the small cubes of butter with a pastry cutter or two knives. When the butter is pretty well incorporated (crumbly feeling), drizzle some of the ice water, little by little and mix dough with hands. Add enough until dough just comes together without being wet or sticky. If too dry and crumbly, add a little more water. Shape into a flattened disk and wrap in plastic wrap. Chill in the refrigerator for at least one hour. 3. 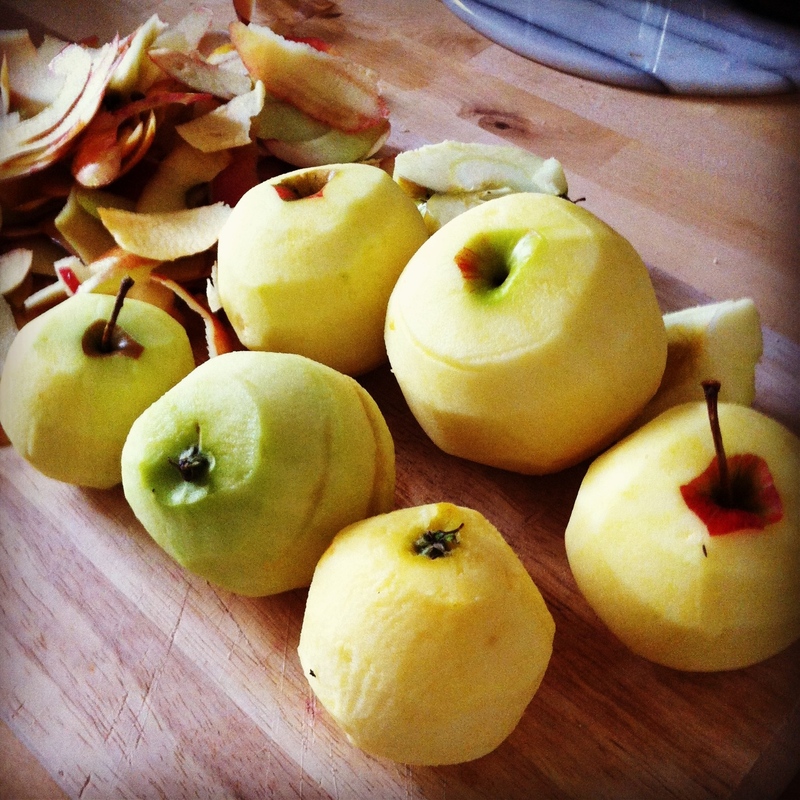 Prepare the apples: peel, cut into quarters and remove seeds as needed. If you like, you can sprinkle with a splash of lemon juice so that they do not brown. 4. Prepare the caramel. Add the butter to an oven-proof skillet and melt. (Note that an oven-proof skillet is the ideal pan to use for Tarte Tatin. I don’t have one, so I simply used a medium sauce pan for the caramel and apple layer, pouring it out into a parchment-lined spring-form pan for the baking part. Though this is not the true Tarte Tatin way, it worked fine and the cake was still pretty when flipped.) Once butter is melted, stir in the sugar with a wooden spoon. 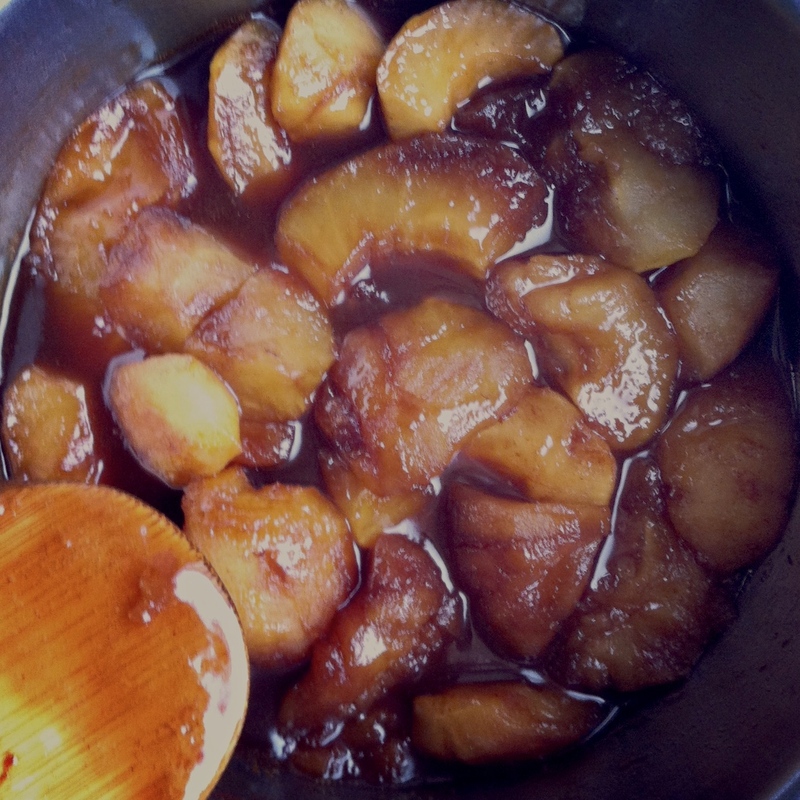 Cook until the syrup bubbles and caramelizes, and turns a chestnut brown color, stirring occasionally. Benoit reminds to be sure it doesn’t darken too much or it will impart a bitter flavor to the end result. Remove from heat. 5. Arrange apple pieces in a layer over the caramel (largest on the bottom). Arrange the remaining pieces over the top. Sprinkle with cinnamon. Return the skillet to the burner at medium high heat and cook for about 15 minutes, covering after the first five. Every few minutes press down on the apples and baste them with the juices. When the juices are thick and syrupy, remove the pan from the heat. You will probably start to smell the caramelization of the apples here. 6. On a lightly floured surface, roll the chilled dough into a circle, approx. 5-mm (3/16-inch) thick and 2.5-cm (1-inch) larger than the top of the pan. Lower the dough over the apples in the skillet, pressing the edge of the dough between the apples and the inside of the pan. Cut 4 small steam holes on the top of the dough. 7. Bake the Tarte Tatin for about 25 to 30 minutes, or until golden, with crispy caramel pieces bubbling up from under the edges. Take it out of the oven and let cool for 10 or 15 minutes, just long enough so that you can handle it. To make it look like a Tarte Tatin you need to turn it out onto a plate, so that the apple layer is on top. 8. Put tarte aside for a few minutes to let the caramel seep down and cool off a bit more. Serve with a spoonful of crème fraîche or ice cream. 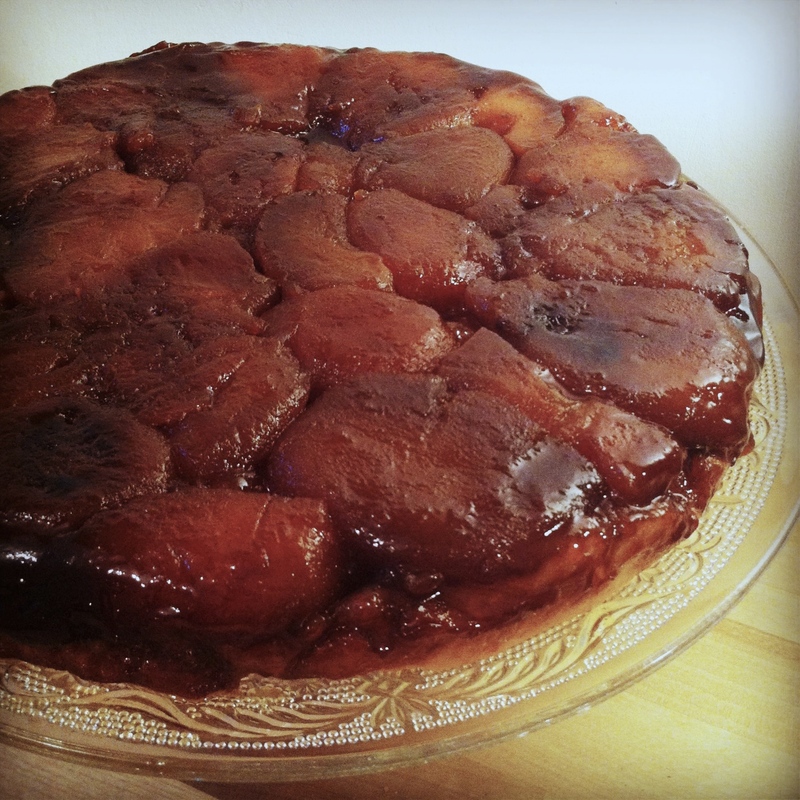 psssss: if you made it this far, I will share with you the results of the apple pie vs. tarte tatin competition…. apple pie by ONE VOTE! oh, YES. Despite Sunday’s Easter feast, the weekend in general had a decidedly un-Easter feel. One may attribute this to the hard fact that every now and then, glancing out the window, blizzard-like conditions were shockingly present. I know, I know, I know… everyone is tired of complaining about the weather. But for me, it wasn’t even the weather in itself. The winter-is-supposed-to-be-over-depression really sunk in on Saturday’s visit to Markthalle Neun to scout out something vaguely Spring-like for our Easter meal. After stand upon stand of bottom of the barrel beets and a scrum of carrots and potatoes, I headed to the supermarket and settled on a couple of small bulbs of fennel grown in Italy. Fennel just seems like it could fit to any time of the year. Fresh, herbaceous and light, it is appropriate raw in summer salads but can also be combined with enhancers like cream or butter for a wintery meal. What about in something sweet? Fennel in desserts I had not before experimented with, but when I stumbled across a recipe for fennel buttermilk cake in an old issue of Gourmet, I thought: perfect. It deceived nothing of seasonality – it felt appropriate for a holiday that is supposed to celebrate Spring, but did not feel anything of the sort. A chameleonic cake, if you will. The preparation of the candied fennel is a bit time-consuming, but aside from that first step, the cake comes together quite easily. It can also be decorative, depending on how beautifully you arrange the fennel in the bottom of the cake pan (mine=not so beautifully) making it impressive for dinner parties or holidays. I hope my next recipe will be with something that betrays the first signs of spring (can you tell I am dreaming of rhubarb?! 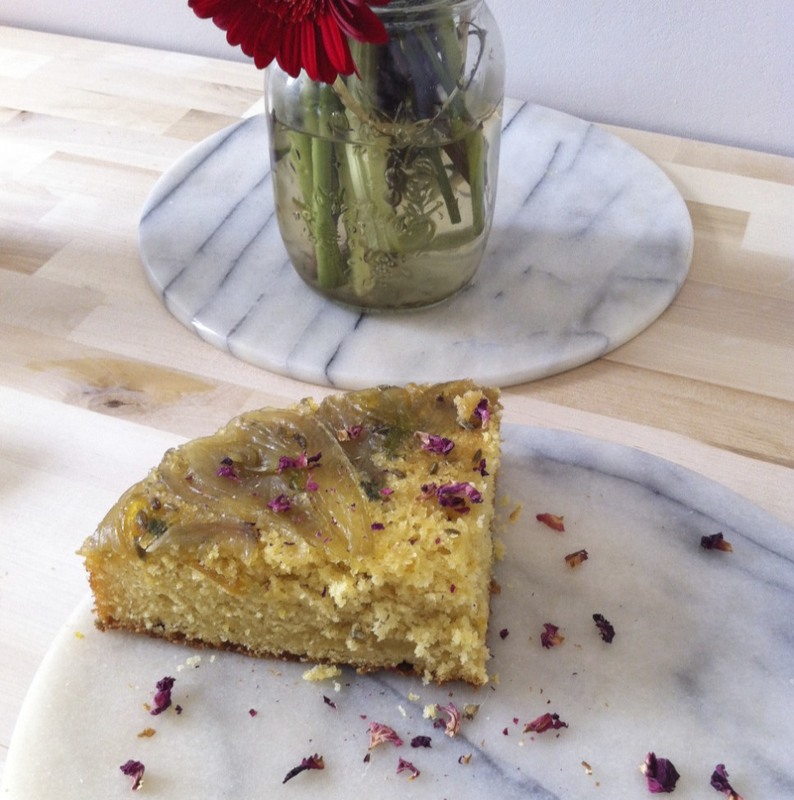 ), but in the meantime be content with the temperature-defying abilities of this fennel cake. Lightly butter pan (I used springform) and line bottom and side with parchment paper. Lightly butter paper. 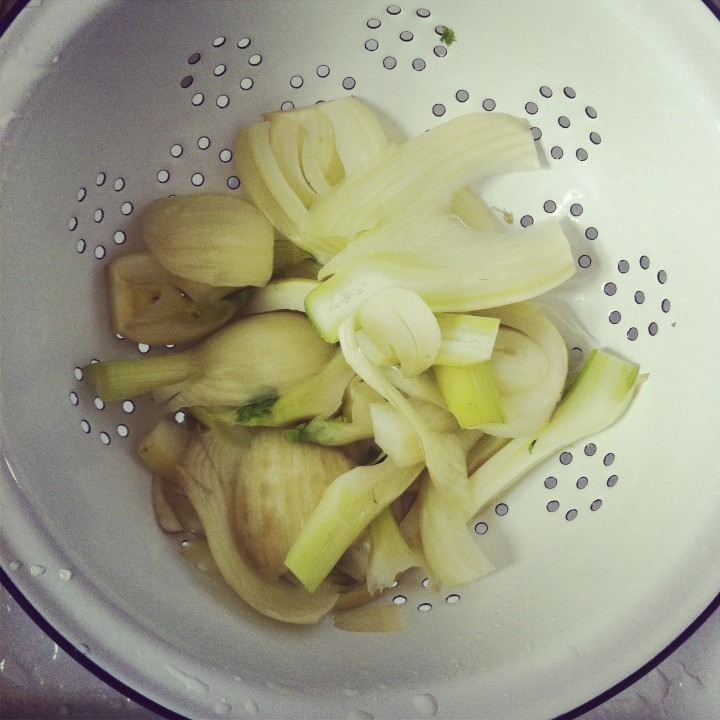 Cut fennel bulbs lengthwise with slicer into enough 1/4-inch-thick slices to cover bottom of cake pan. Cover fennel with cold water in a medium saucepan and bring it to a boil. Drain fennel and set aside. Add sugar, water (3/4 cup), zest, and fennel seeds to saucepan and bring to a simmer, stirring until sugar has dissolved. Add fennel slices and very gently simmer until tender and translucent and liquid is syrupy, about 40 minutes. Lift fennel slices out with a fork and arrange decoratively in bottom of cake pan. Boil syrup to reduce to about 1/3 cup liquid. Cool syrup slightly, then pour over fennel, seeds and lemon strips and all. Garnish with crushed rose petals, if desired. I promise it is not the winter blues that have kept me from posting for the past couple weeks. Though I have a few visiting kitchen opportunities in the works, I will pause for a moment and share with you one of my personal favorite recipes, which I assure you remedies anything that may be going on outside. Wind chill, be gone! With its heavy reliance on citrus, namely blood oranges, this cake recalls a Floridian grove or perhaps a Southern Italian Sunday afternoon much more than it does a snowy cityscape. But with an influx of imported citrus to Northern Europe during January and February, adding a bright note to your cooking seems to be a sensible, not to mention cheery, solution to the abundance. 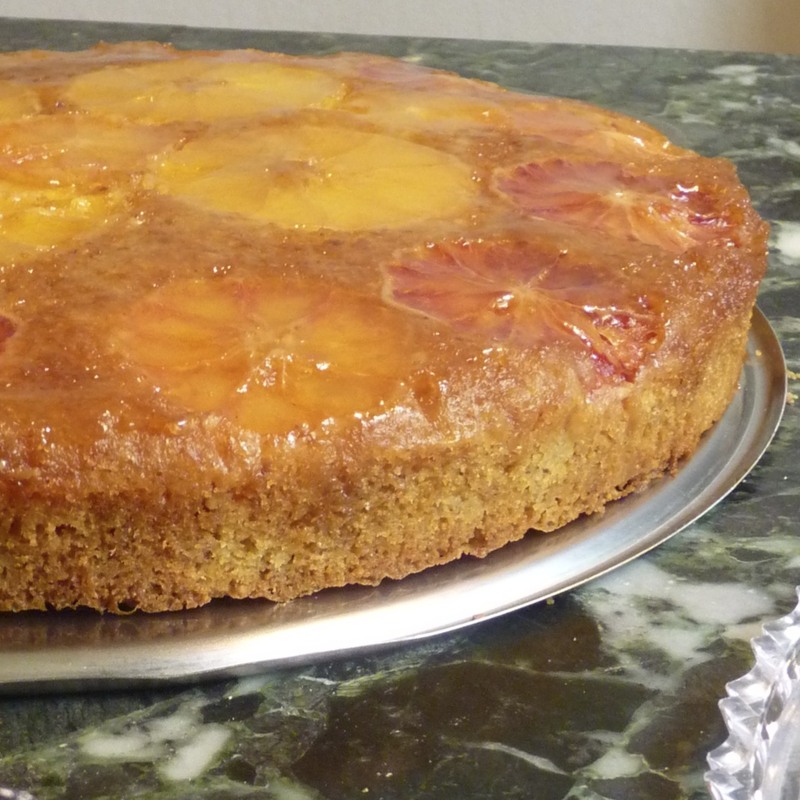 This is a classic upside down cake. 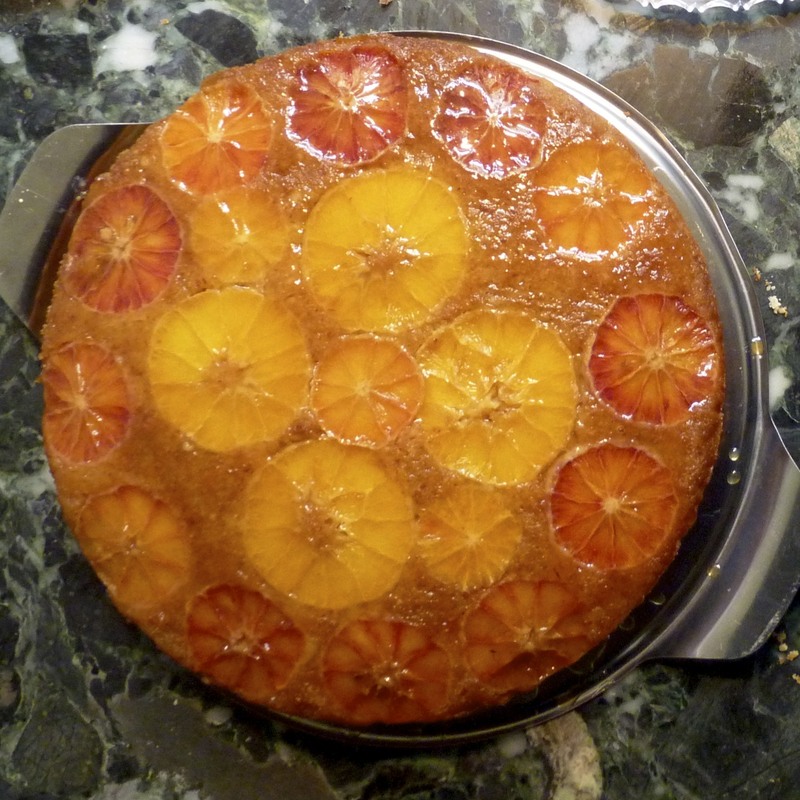 The first layer is a caramel, which is a poured into the bottom of a spring-form pan and left to harden, followed by a layer of tightly packed sliced blood oranges, and lastly the cake batter. The miraculous thing that happens is that the caramel and the orange layers fuse together during baking, and when the thing is removed from the oven and flipped, the sweet/sour medley drips down, infusing the entire cake. I also particularly like the crumbly nature of the cake itself. This is due to the uncooked polenta and ground almonds added to the batter. And if that’s not enough for you, the orange marmalade glaze adds the finishing touch in order to slightly counter-act the rich flavor of the caramel (and to make it look prettier). The recipe is not my own. I found it a few years back in Gourmet magazine, which itself ‘borrowed’ it from Ottolenghi: The Cookbook. 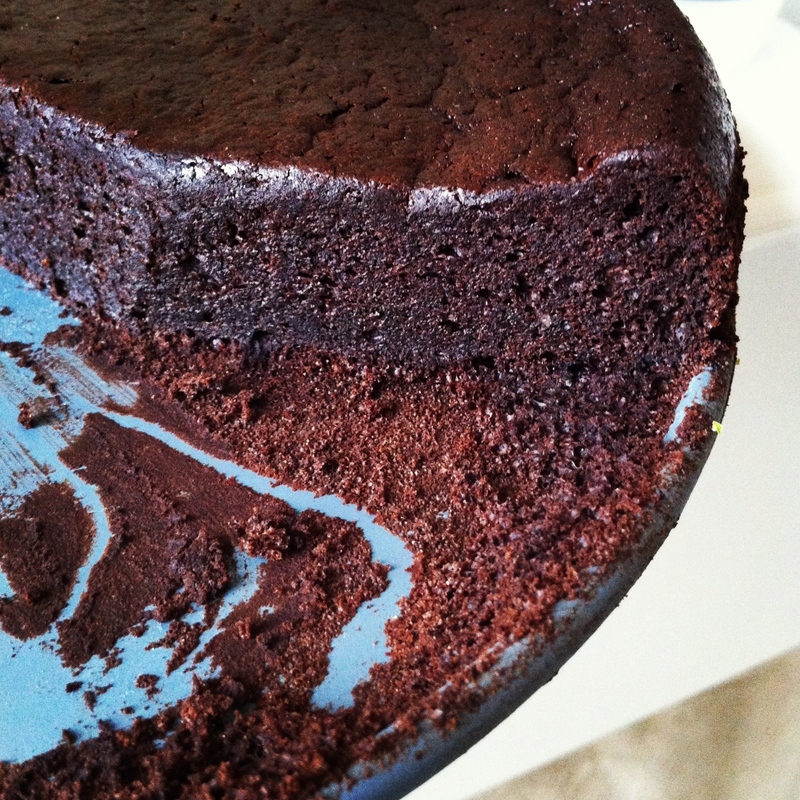 Maybe it was a coincidence that this cake just popped into my head today, but I suppose I already had Israeli-born British chef Yotam Ottolenghi on my mind after reading a fascinating New Yorker feature on him during a long train ride last week. Nevertheless, I have followed trend and also slightly adapted the recipe, most notably switching out regular navel oranges for blood oranges. If you want, you can alternatively use a combination of blood and navel oranges to play with the colors of the finished cake, since there will be a subtle difference, even after baking. 1. Preheat oven to 350°F or 175°C with rack in middle. Lightly butter a 9-inch round cake pan, then line bottom with a round of parchment paper and side with a strip of parchment. Bring sugar and water to a boil in a small heavy saucepan over medium heat, stirring until sugar has dissolved, then wash down any sugar crystals from side of pan with a pastry brush dipped in cold water. Boil, without stirring, swirling pan occasionally so caramel colors evenly, until dark amber. Keep a close eye on it so that it does not burn. Remove from heat and add butter, swirling pan until incorporated, then carefully but quickly pour caramel into cake pan, tilting it to coat evenly. 3. Peel blood oranges including white pith with a paring knife. Cut oranges crosswise into 1/4-inch-thick slices. Remove any seeds and arrange slices in 1 layer over caramel. Beat butter with sugar using an electric mixer until just combined. Add eggs 1 at a time, beating well after each addition. Zest orange and juice one half of it. Mix in orange juice and reserved zest. Whisk together flour, baking powder, and salt. 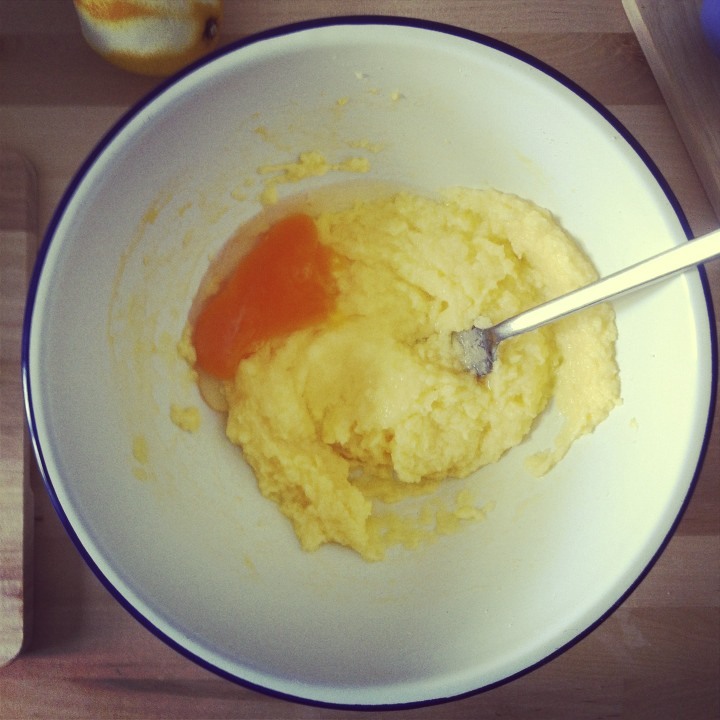 With mixer at low speed, mix almonds, polenta, and flour mixture into egg mixture until just combined. Spread batter evenly over oranges (preferably with an offset spatula). 5. Place in oven and bake until a wooden pick inserted into center comes out clean, 1 to 1 1/4 hours. Cool in pan 5 minutes. Invert cake onto a cake plate and discard parchment. 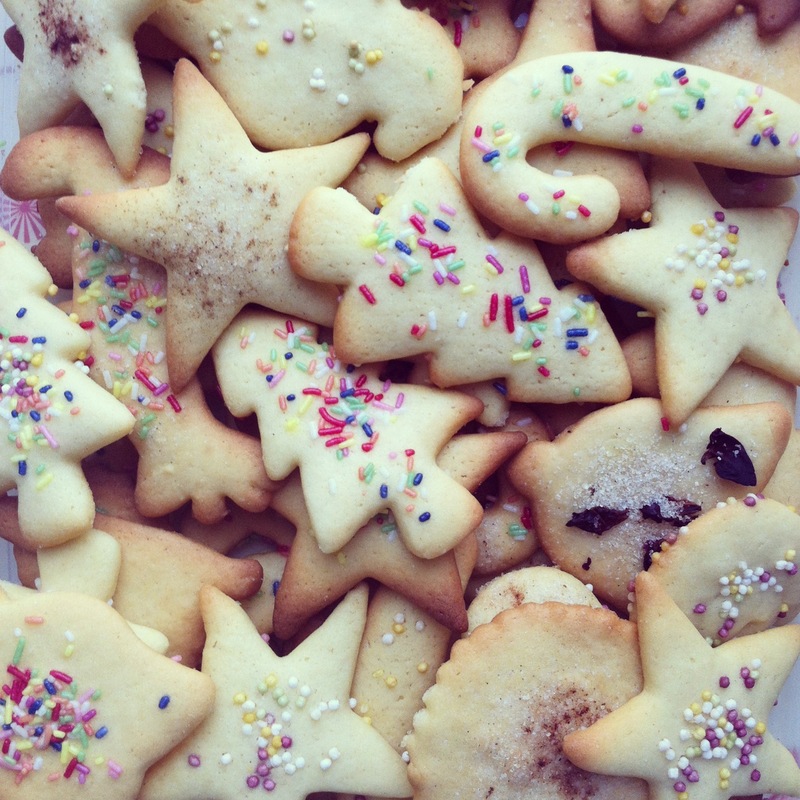 On today’s Christmas dessert table stood the traditional Norwegian Sandkaker or “Sand cakes”. 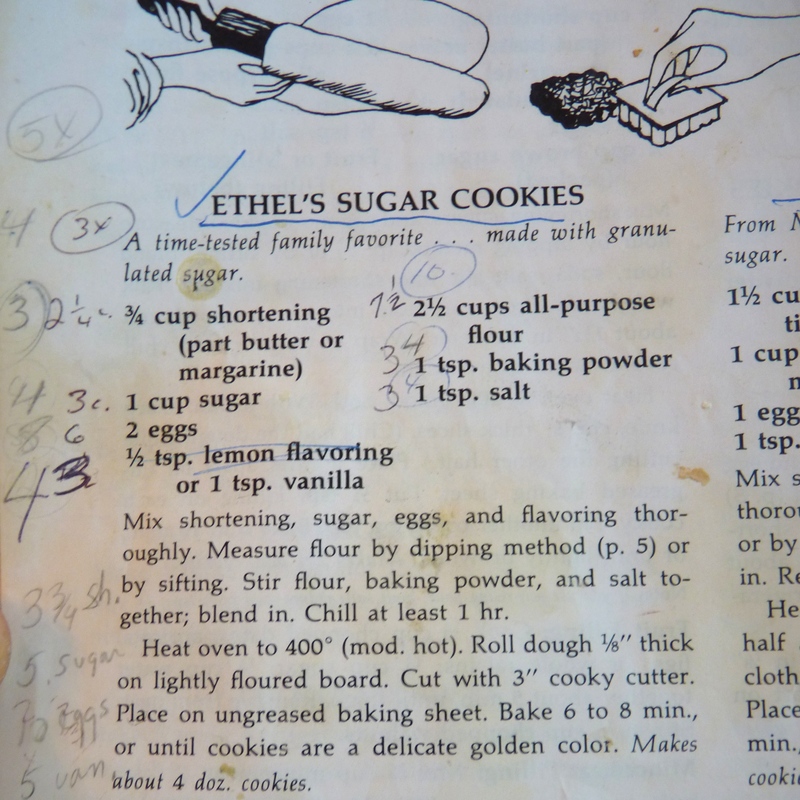 The recipe is an old family one, coming from the baking legend, Auntie Esther. It makes a very simple, yet rich and buttery tart-shell like cookie, which actually can be filled with fruit, cream or pudding, similar to a mini-tart. In our family, though, we just eat them plain, which I find more than ok and an interesting alternative to standard holiday sugar cookies. A major part of the appeal of Sandkaker is the adorable tins in which they are baked. My mother has a healthy stash of them, some older and less sanitary-looking than others. Auntie Esther always claimed that no butter was needed before pressing the dough into the forms. Important, however, is that they should not be washed between uses, so that they remain well-seasoned and can more easily release the finished cookies. Next time I might go the way of washing, buttering and flouring them, as it was a bit difficult to get the cakes out of the forms in the end. Nevertheless, they are a delicious example of Nordic holiday tastes. Happy Christmas! 1. Cream together butter and sugar. Add egg whites and mix well. 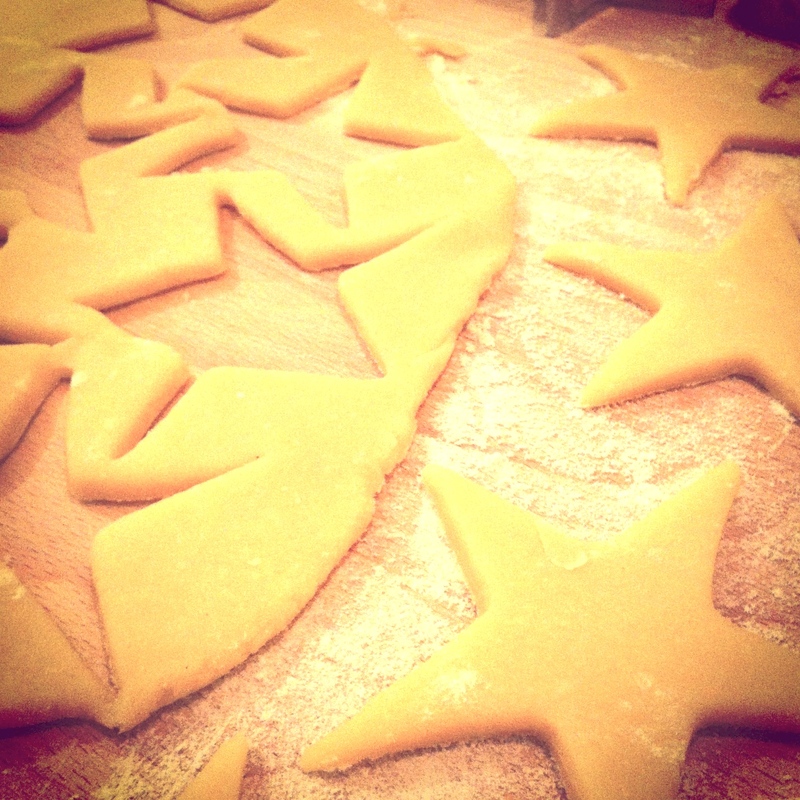 Stir in extracts and flour. 2. Bring dough together quickly into a ball, cover with plastic wrap and refrigerate for at least one hour, ideally overnight. 3. Preheat oven to 350° F (175°C). 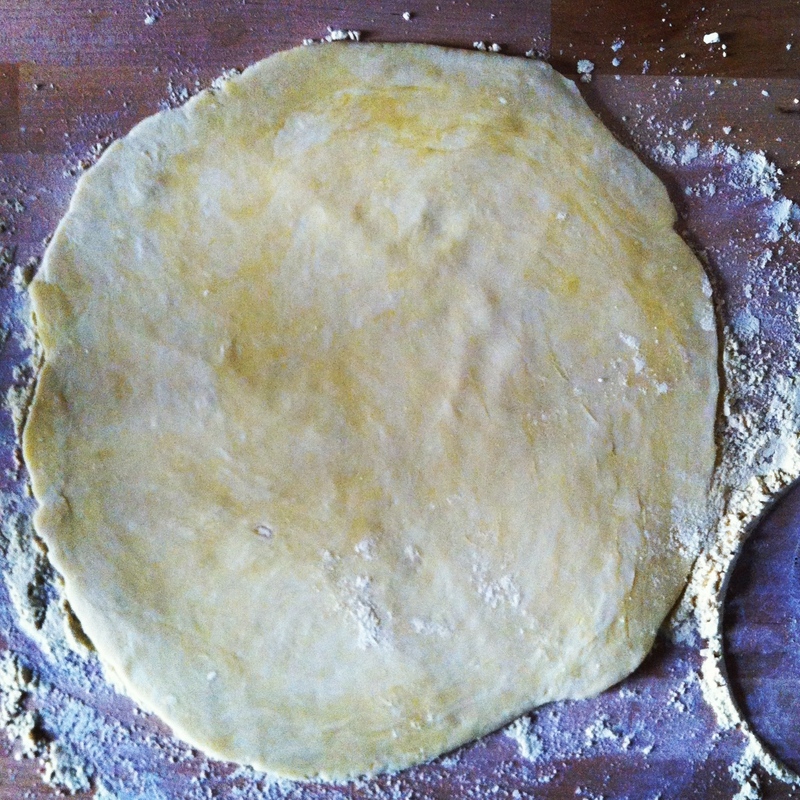 Cut off a small piece of dough, form into a small disk and press evenly into the form, as if it were a pie base. Repeat with all forms. 4. Place the forms onto a baking tray and into the oven. 5. Bake for 10-12 minutes, remove from oven and turn tins upside down so that as they cool, the cakes are released. Last year Thanksgiving in Berlin came and went. I didn’t celebrate it. This year I am thankful for many things, but among them to have made some spirited American friends who invited me to a heartfelt, football-inclusive, early Thanksgiving dinner last weekend. I don’t want to say it was authentic, because that paints it as a mere staging, a going through the motions, of tradition. Because it was more than that. It was the real thing. More than one of us voiced a palpable excitement and anticipation for the day, equating it with the way Christmas Eve felt as a child. I think that we all in some small way re-discovered what the holiday was about. Ok, now cue the cheesy music. I like to think I am a fairly modest person. But when the topic of apple pie comes around, I have absolutely no problem climbing up to the highest possible pedestal, placing a wreath of laurel on my head and proclaiming to lands far and near that I have, incontestably, the best recipe known to man. The problem is that I honestly have no idea where this recipe came from. You see, it has been in the “family” for years. Well, eight years, to be exact. It was the fall of our senior year of college and Kate, my good friend and partner-in-culinary-crime, and I got ourselves into a somewhat disturbing pattern of apple pie baking. In retrospect, it surely had a lot to do with scholarly stress and even more to do with procrastination. 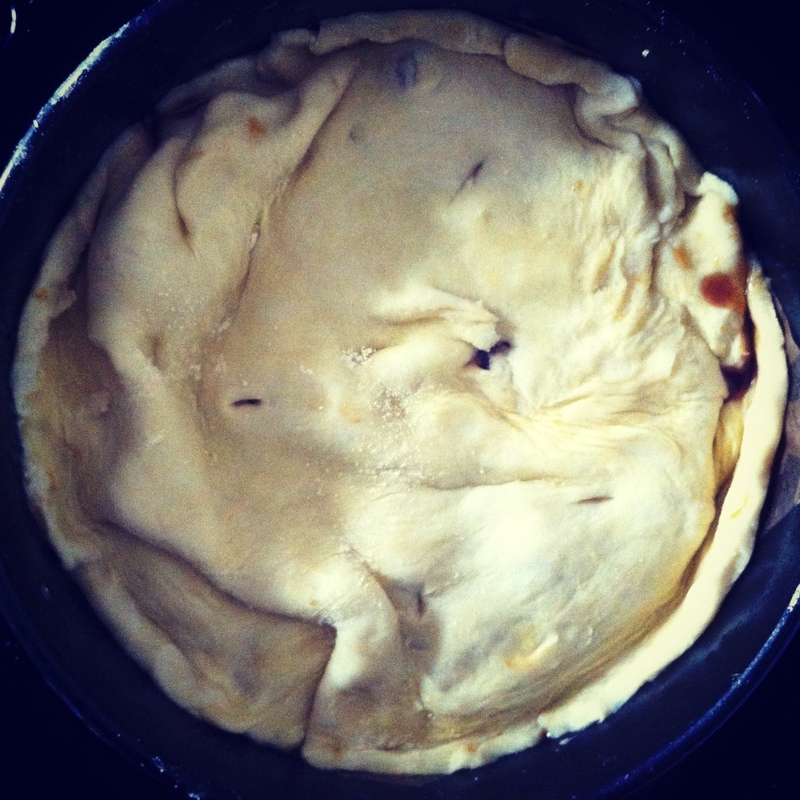 We relished the fact that we could cast all responsibilities, studying and studio hours aside and just… bake pie. It could all be so simple! We even had a special accent that we would use when baking the pies– somewhere between Georgia hillbilly and that mid-Atlantic drawl popular with actors from the 50s. But somehow, that little apple pie recipe of unknown origin was utter perfection and became legendary. 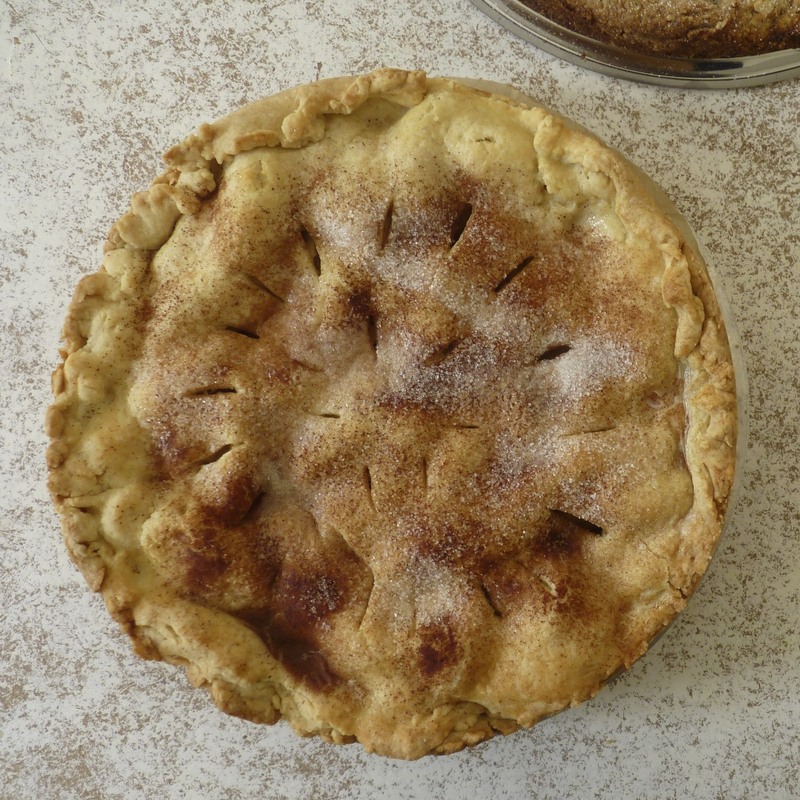 I have divulged our apple pie recipe to a few friends since that baking frenzy eight years ago. And now I will pass it along to you. Try it out (for Thanksgiving, if you like) while the apples are still at their peak. And give thanks to me. 1. Make the dough for the crust: Sift dry ingredients. Cut all the butter, minus one tablespoon, into dry ingredients. Sprinkle in vegetable oil, then milk, one tablespoon at a time, and mix after each addition. You will know the dough is the right consistency when it comes together in a ball but is not too sticky to handle. When combined, form a ball with the dough and cut in half. Wrap each half with plastic wrap and refrigerate for about one hour. 3. Peel and dice apples about 1/3-inch (almost one centimeter) thick. Toss in a bowl with a splash of lemon juice to keep them from browning. 4. 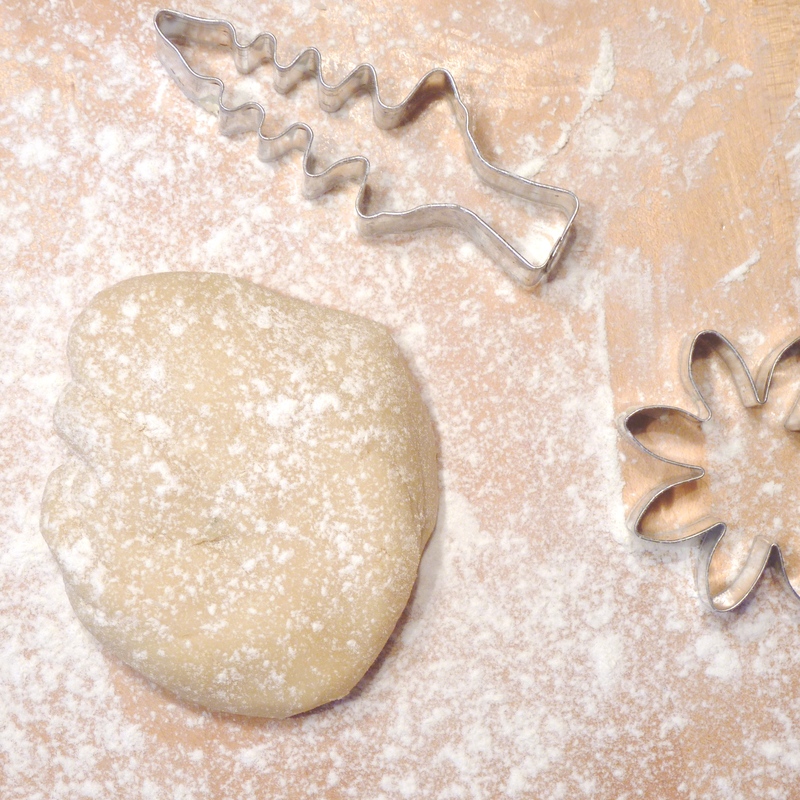 Remove dough from the refrigerator and roll out one half for the bottom crust on a floured surface. 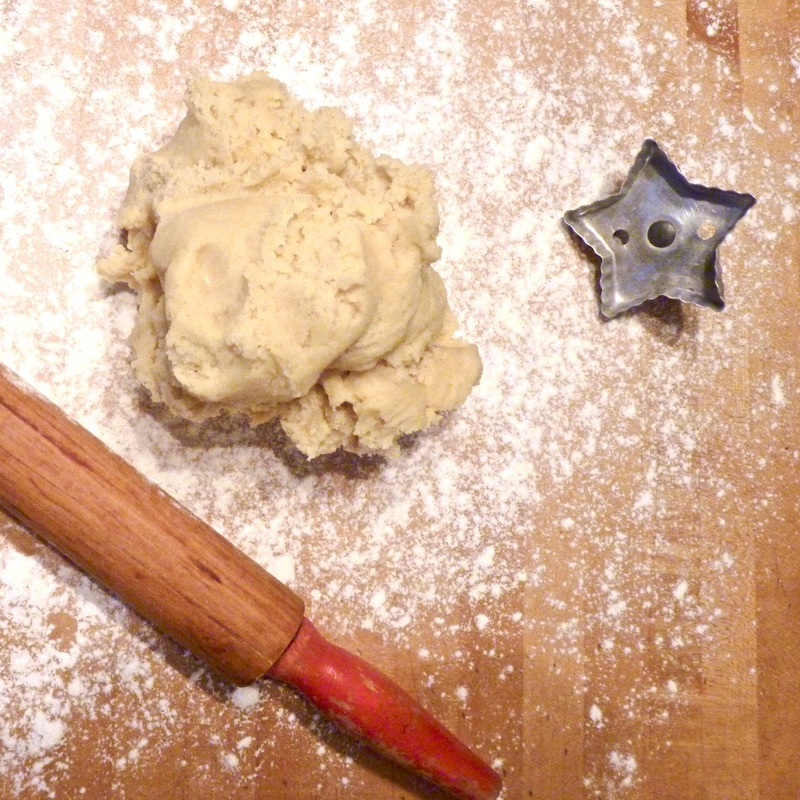 Using the rolling pin, fold gently in half and transfer into a lightly buttered pie dish. The edges of the dough should hang over the sides of the dish a bit. Then roll out the top. 5. Mix filling: Sift dry ingredients. Mix well with chopped apples and water. Turn mixture into the dough-lined pan. Dot with little pieces of the remaining butter. 6. Cover the apples with the top round of dough and seal the edges by pinching them together. Make tiny holes or slits in the top to allow steam to escape. Brush a bit of milk on the top of the pie and sprinkle with 1 tablespoon of sugar (and a bit more cinnamon, if you like). It was months ago that I asked my colleague Kloud, who hails from Hong Kong, to teach me to make a dish from his native land. I suppose I thought he would prepare something Chinese (or Cantonese), probably a rice- or fish-based dish. What I did not expect was the delicate custard that I can only describe as a like a steamed flan. Which is actually a terrible description. 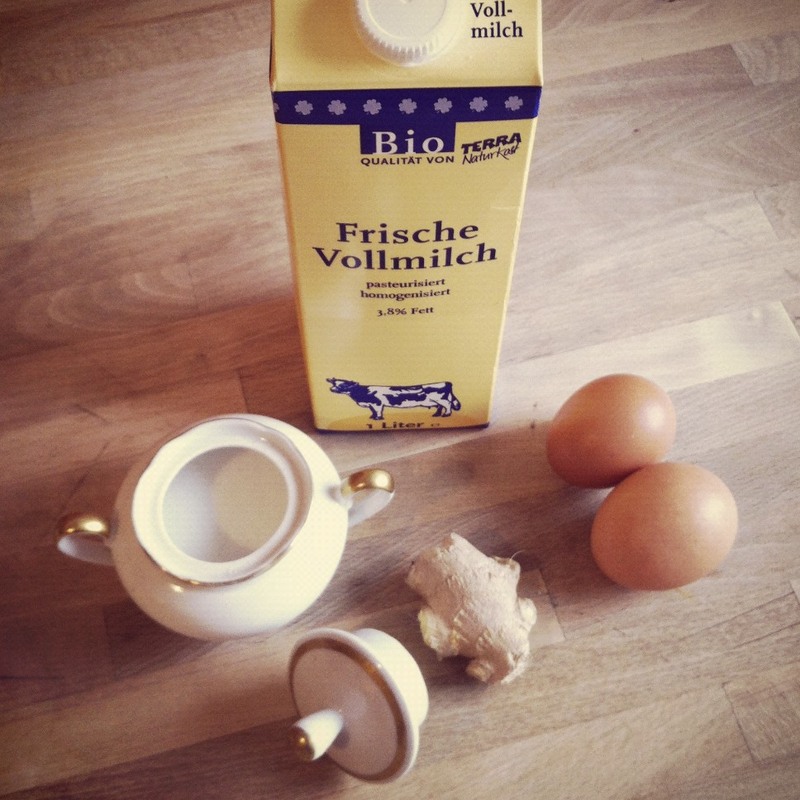 Trust me, if you make it yourself, you will see that it eludes characterization in terms of European traditions. Things and experiences that defy my expectations usually also delight me, as was the case with this smooth, not-too-sweet dessert custard. Kloud explained that the kinds of food now popular in Hong Kong actually come from very diverse culinary traditions, Eastern and Western. From the direct region, not only Chinese but also Thai and Japanese cuisines are ubiquitous. Even ‘tea time’, seemingly a hangover from British colonial times is a must in Hong Kongers daily schedule. 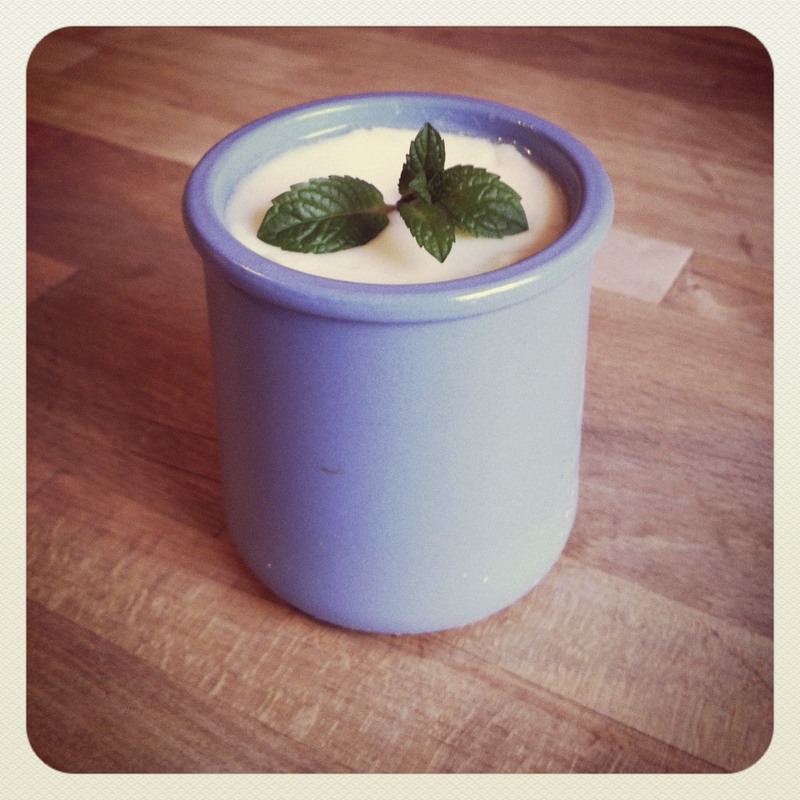 May I suggest, then, the following steamed ginger custard with a cup of white tea at around four in the afternoon? For those of you out there like me, who are not expert in the art of steaming, this dessert might take some practicing to achieve the correct consistency. But luckily, the ingredients are very simple and usually ones you have sitting around anyway, so a couple of wasted batches will not break the bank. 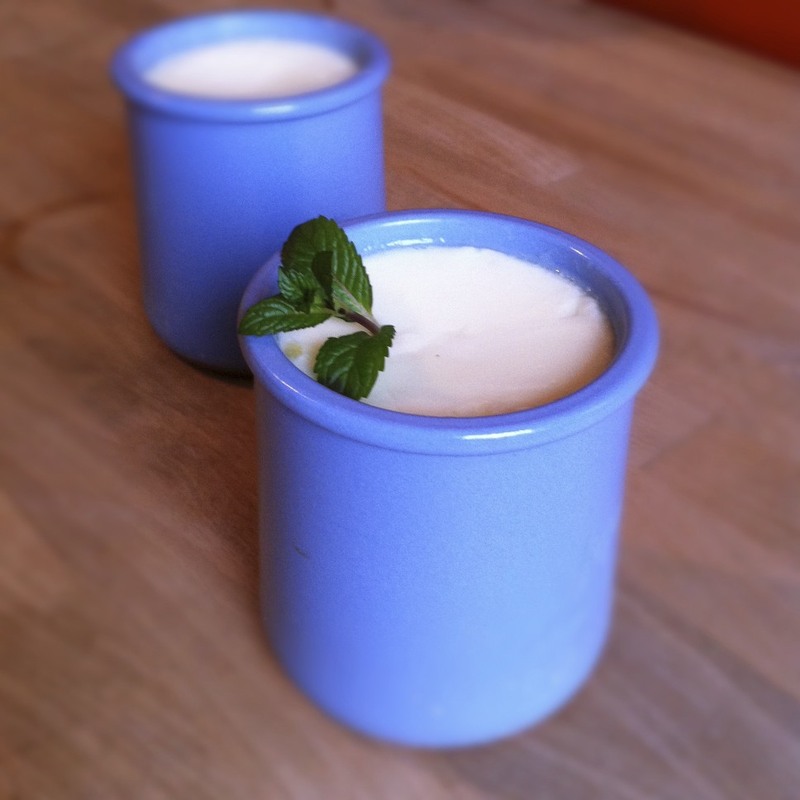 Set in a ramekin with a leafy garnish, or even in teacups, steamed custard can be uniquely and beautifully presented as little individual desserts to end a dinner, as well. (Note that I wouldn’t necessarily call the version that I present here beautiful… On the contrary, the containers that I used were a bit too tall for steaming and thus needed more time than they should have.) If you are cooking for a larger group, you can also just use one big bowl, as Kloud did. 1. 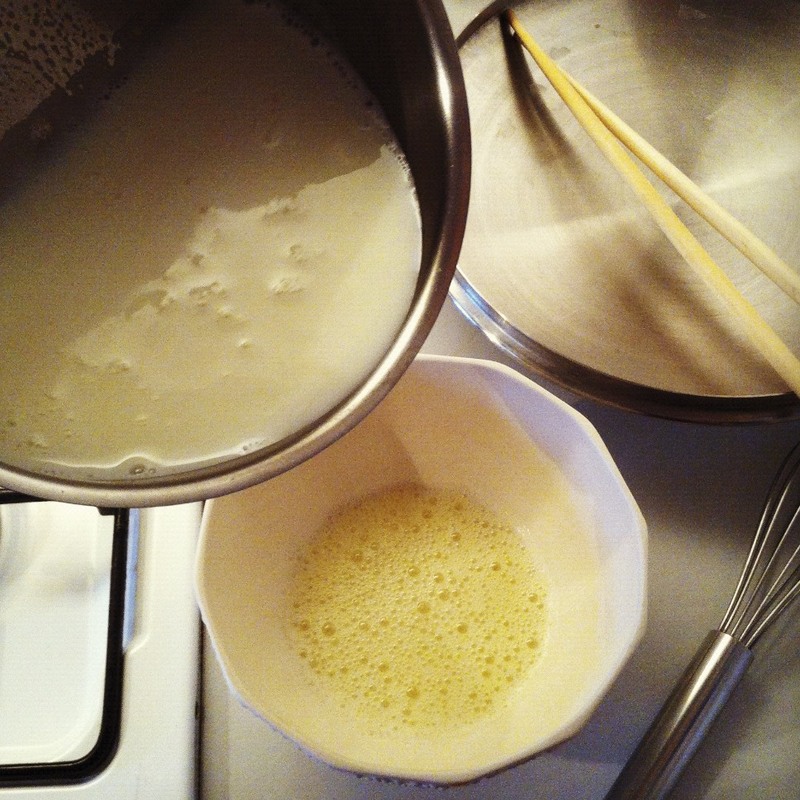 Whisk milk and sugar together in a small saucepan and heat on medium until just before it begins to boil. (Don’t let it boil, as it will not become solid later!) You will see a lot of steam coming from the mixture when it’s the right time. 2. Whisk the egg whites with a fork until light and frothy, about one minute. Temper the egg whites with 1/4 of the hot milk mixture, whisking quickly. Then add the rest of the milk mixture and whisk again. 3. Pour the mixture through a fine mesh sieve and skim any bubbles off the top. Ladle or pour mixture into ramekins or heat safe bowls (with ginger juice already inside, if using). Cover the ramekins with foil and steam for 10-15 minutes, or until the custard has set but is still jiggly. Note: I don’t have a real Chinese-style steamer, so I just used a deep pan with a cover. 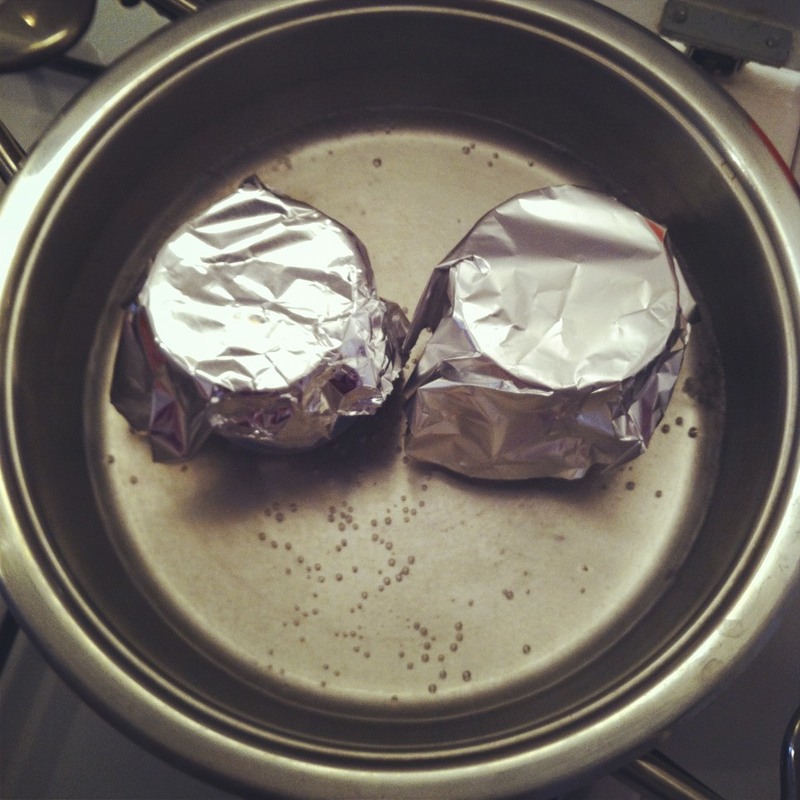 I filled the pan with water a few centimeters in height, brought to a medium boil, placed the foil-covered ramekins inside and then covered for the duration of the steaming time. Serve immediately or let cool and chill in the refrigerator for an hour. *Peel skin off a small knob of ginger and run it through a grater. 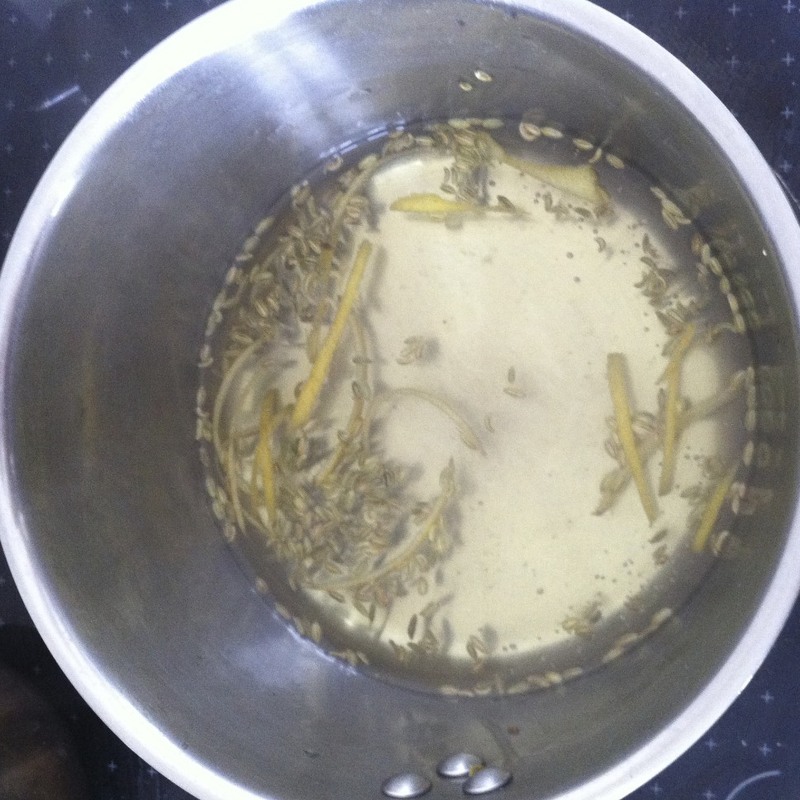 Put the grated ginger in a fine mesh sieve and press ginger with the back of a spoon to release the juice. 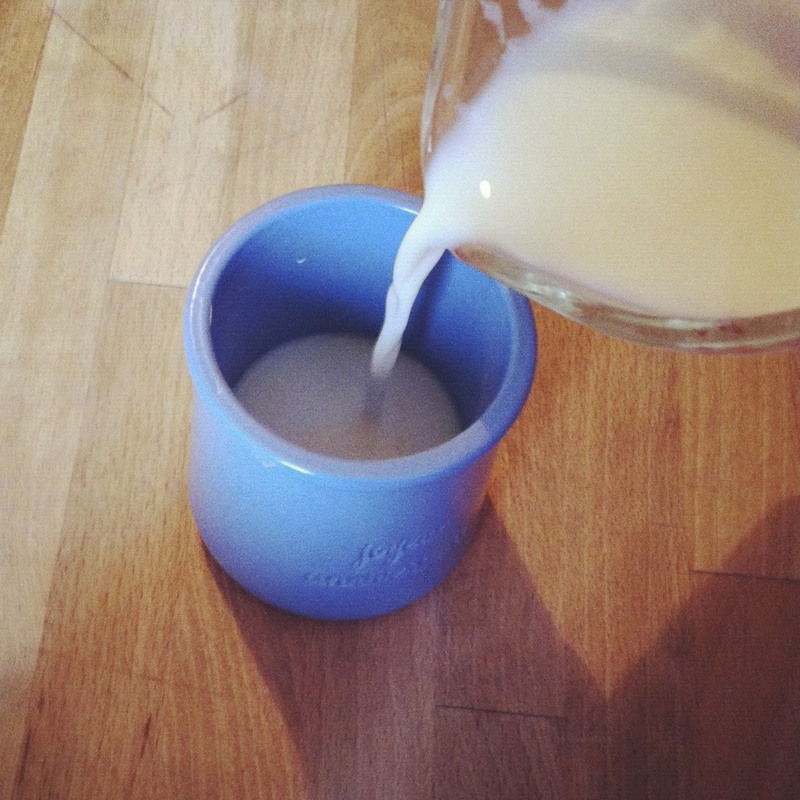 Put ½ tsp in the bottom of each ramekin before pouring the milk mixture inside. I have written already about Dritte Mitte, the Italian-style Aperitivo that Katharina, Til, Lorenzo, Frank and I host once per month. We love to talk about how much work it is. Oh, the hours we spend trolling the market for the best greens or searching for elusive cans of ginger beer that the cocktail-of-the-week would not be complete without. Not to mention the time spent in front of the stove, rolling polpette, elbow deep in frying oil. Yes, we complain, hopefully more to each other than to our guests, but when all is said and done, we do, though we would never say it out loud, love every minute. We all enjoy (understatement) eating and cooking, and the fact that we need to provide sustenance for some 80-100 people every four weeks keeps us on our toes, keeps us trying new recipes. Because if not, we would tire of it, simple as that. This last week’s Aperitivo consisted of lots of fat. Maybe it’s the fault of the colder weather that is now descending on Berlin, but every new plate we brought out to the guests seemed more calorie-rich than the last. Shortbread, sweet and savory at once, was a major sub-genre under last week’s general theme of Fat. 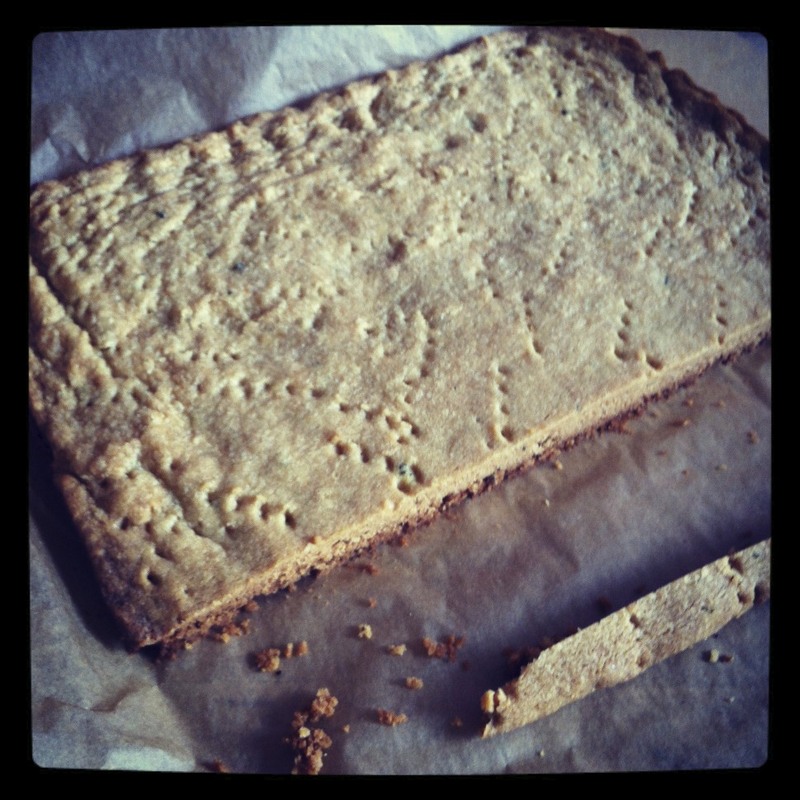 We baked two different types, one being Rosemary Shortbread, which is a long-standing favorite of mine. I originally sourced the recipe from the NYTimes (Melissa Clark). 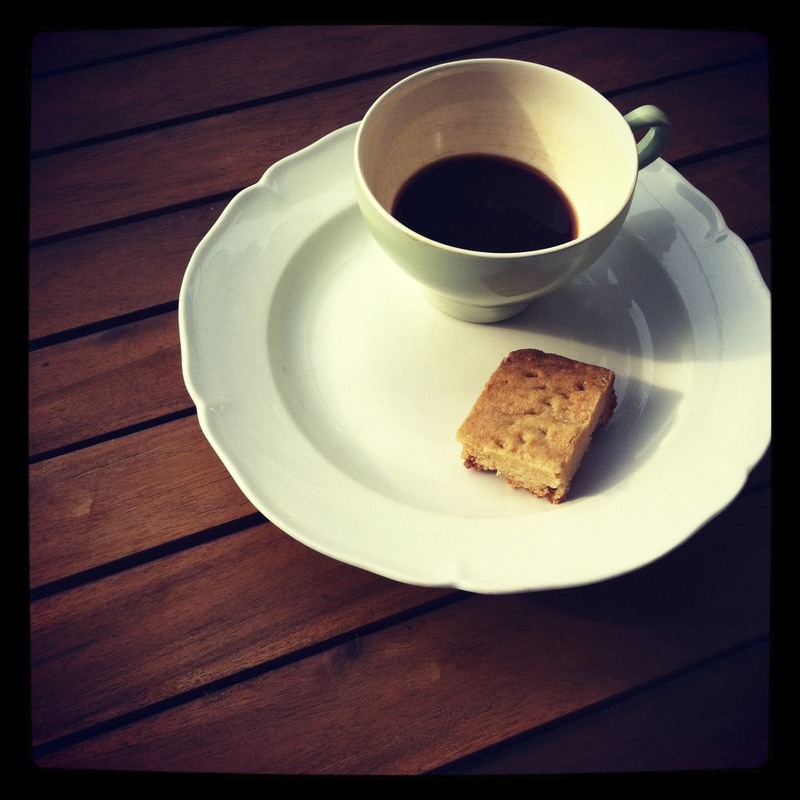 Over the years, I have modified it slightly; this is pretty much as perfect as you can get when talking shortbread. Don’t be afraid of the massive amount of butter. It is what makes shortbread shortbread, after all. I think that without the addition of the fresh rosemary, the shortbread is still ok, but the herbaceous quality gives it an extra kick that also helps to cut the richness of the butter. A good dose of salt and sea salt makes it sweet and savory at the same time. 1. Heat oven to 325°F or 165°C (yes, low, as they must bake relatively slowly). 2. Whisk together flour, sugar, rosemary and salt. 3. Add butter, and honey (once, I replaced the honey with a lemon-flavored simple syrup that I had made for another purpose, and I found the result to be divine). Cut in with a pastry cutter, two knives or your hands (if you have a food processor, go ahead and use it) until mixture is the texture of fine crumbs. 4. Rub together/pulse in food processor a few more times until some crumbs start to come together, but don’t over-mix. Dough should not be smooth. 5. Lay parchment paper on the bottom of an 8- or 9-inch (20- or 23-cm)-square baking pan and press dough evenly into it. Prick dough all over with a fork. 6. Bake until golden brown, 35 to 40 minutes for 9-inch pan, 45 to 50 minutes for 8-inch. Cool slightly. 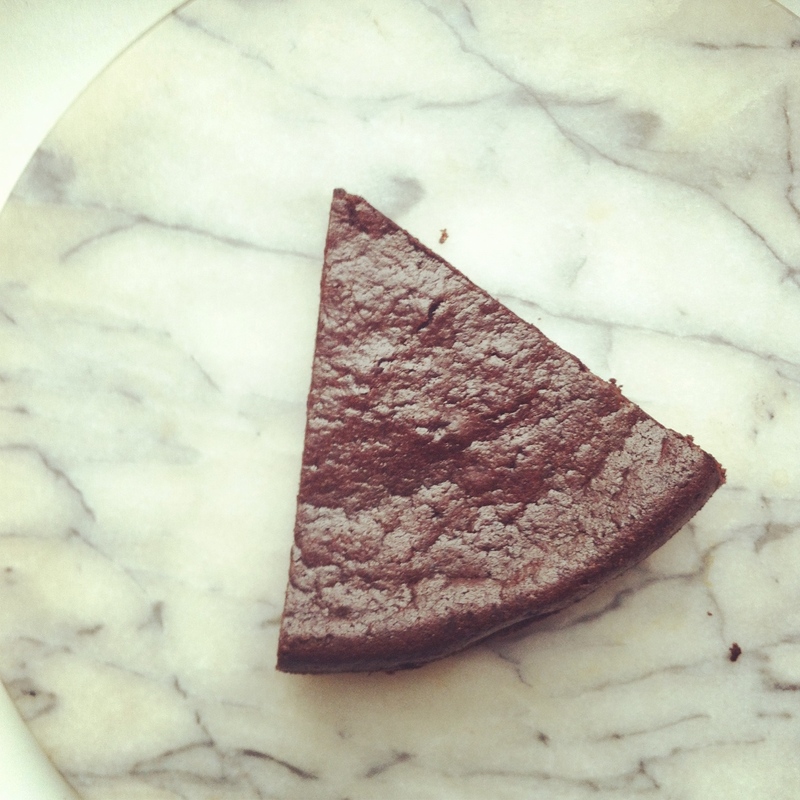 Cut into squares, bars or wedges while still warm. Yield: One 8- or 9-inch shortbread.